On the 7th November, the rooms of NAK Neuer Aachener Kunstverein become a point of departure for a dialogue between the current exhibition SOUND NOIR by Jacob Kirkegaard and Konrad Smoleński and the guest project Subjected Sounds. Young artists from Maastricht and its surroundings further the investigation of the relation between sound and architecture, initiated by our current exhibition, which acts as a framework for Subjected Sounds. The programme begins at 7 pm and has been composed by Paul Devens, professor at the Academy Maastricht. Installations and performances are shown, two lectures will be given, a concert and a dj-set will complete the evening. 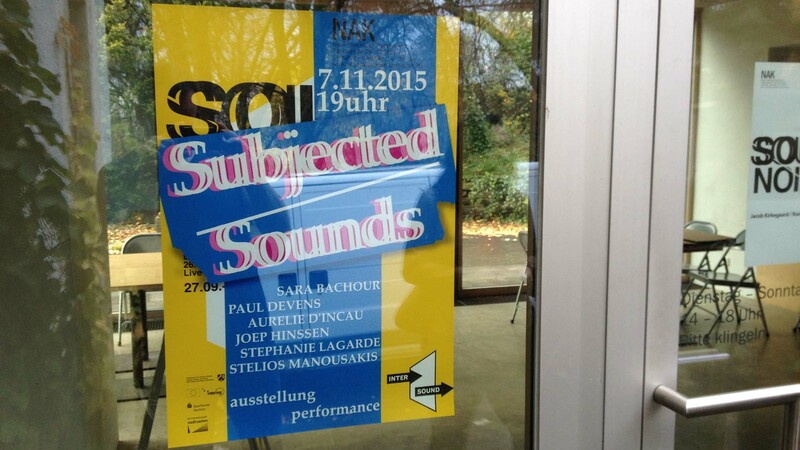 Taking part in Subjected Sounds are: Sara Bachour, Aurelie d’Incau, Paul Devens, JoepHinssen, Stelios Manousakis und Stephanie Lagarde.